Title Palin: The great debater published to cocoa-touch. Ask nearly anyone in Alaska, and they will tell you that Governor Sarah Palin is a great debater. If anyone knows the challenge that lies ahead for Senator Joe Biden, it is Andrew Halcro, 44, who took part in a handful of debates with Mrs Palin during Alaska's 2006 gubernatorial race. "The one thing I found during the  debates was no matter how knowledgeable her opponents were on the issues, it didn't matter," Mr Halcro told BBC News. "She has an amazing ability to turn a 45 second answer into a folksy story... she's never been forced to know the issues." Mr Halcro said Mrs Palin's biggest strength is her ability to "fill the room with her presence". Having studied at Harvard's Kennedy School of Government and Harvard Business School, in addition to being a lifelong Alaskan and lawmaker, Mr Halcro came to the debates armed with a wealth of knowledge and statistics. Mrs Palin even said Mr Halcro would make "the awesomest statistician," when asked during a debate what position she would appoint Mr Halcro to if elected governor. Still, statistics were not enough to put even the smallest dent in Mrs Palin's rising popularity. "There were many times the third candidate and I would walk off stage and shake our heads," Mr Halcro said. "It wasn't policy it was populism." Whatever it was, Mrs Palin beat her opponents, garnering 48% of the vote, while Democrat candidate Tony Knowles received 40% and Independent Halcro received 9%. "I don't think anyone could have beat her," Mr Halcro said. "It wasn't about how much she knew about the issues. People didn't care about her experience, they just thought, 'This is the drink of water we need'." Mr Halcro, and many others from Mrs Palin's home state, will be watching to see whether her commanding presence on stage this Thursday will similarly capture the hearts and votes of the rest of Americans in the "Lower 48" states. I think she has more to lose now. Her ratio of importance to the Republican ticket was greater than Biden's to the Democratic ticket. She carries more weight, so there's the possibility for an equally large downside. But Richard Parker, a lecturer in public policy at Harvard's Kennedy School of Government, said it may be tricky to transfer her immense success in Alaska on to the national stage. "I think she plays to great advantage the small town hockey mom persona," Mr Parker said. "For Alaska that's terrific. But for states like Ohio and Pennsylvania, who are dealing with panic about the economy, who knows?" 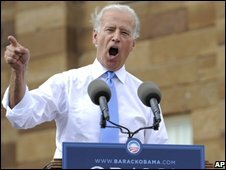 At the height of Mrs Palin's popularity honeymoon a couple of weeks ago, Mr Parker said it was Mr Biden who most needed to put on a strong performance. But with the downturn of the economy, the public's dubious reaction to Mrs Palin's recent interviews, and some conservative columnists calling on Palin to withdraw from the ticket due to her inexperience, Mr Parker said more focus will be on Mrs Palin. "I think she has more to lose now," Mr Parker said. "Her ratio of importance to the Republican ticket was greater than Biden's to the Democratic ticket. She carries more weight, so there's the possibility for an equally large downside." Nearly 55 million viewers tuned into the presidential debate last Thursday, and with more than usual focus on the vice-presidential candidates in this election, Mr Biden and Mrs Palin can expect to have a lot of eyes watching them. Mr Halcro, a Republican still unsure who to vote for in November, said the key for Mr Biden is to focus on the policy issues and let the moderator ensure Mrs Palin answers the questions. "He shouldn't be afraid to point out contradictions in a respectful manner," Mr Halcro said. "He needs to be congenial and not appear patronising or bully-like." Barack Obama's chief strategist David Axelrod has praised Mrs Palin's debating skills, recognising it will be a challenging debate. "I would imagine that Biden and his counsellors are going to keep it as low key as possible and hope the questions she's asked will do her more damage," Mr Parker said. "The last thing he can afford is a disaster." Mrs Palin, on the other hand, has the challenge of maintaining her undefeated debate record and proving to the rest of the world that her readiness to lead is not in doubt. "Ten days ago, if you asked how important the vice-presidential debate would be, I would say intensely important because of Palin's attractiveness across party lines," Mr Parker said. "But now with what is going on on Wall Street, I don't think that her inexperience is going to play well." 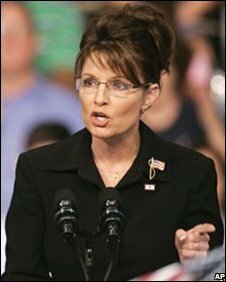 ... claims will surprise the Republicans who have begun to fear the debate following Palin’s ... her not knowing what she is talking about, all of a sudden she is a great debater? I've read most of them, again with a great appreciation for the press, for the media," Palin replied. Asked for examples, she said, "Um, all of them, any of them that have been in front of me all these years. After a week-long torrent of calls and e-mails from angry voters opposing the rescue package, the tide turned after markets plunged on Sept. 29 in response to the House vote. ``Over $1 trillion worth of market value was wiped off the books by the stock market drop,'' said Senator Robert Bennett, a Utah Republican. ``It is ordinary people looking at ordinary pensions, with their ordinary Main Street kind of 401(k) plans, who lost that $1 trillion. And they lost it in a matter of minutes.'' Texas Republican Representative Joe Barton's office said constituent calls and e-mails swung to as much as 70 percent in favor of congressional action, after having been overwhelmingly against a taxpayer rescue of Wall Street. The Dow Jones Industrial Average's record 778-point nosedive two days ago ratcheted up pressure on Congress. Flood of E-Mails The flood of e-mails to Capitol Hill swamped congressional computers, slowing communications and Internet access, said Kyle Anderson, a spokesman for the House Administration committee. On Google Inc.'s search engine, ``bailout vote'' and ``House vote'' were the fifth- and sixth-most-searched terms on Sept. 29. ``Roll call vote'' and ``who is my congressman?'' also made the top 50. House Minority Whip Roy Blunt, the Republicans' chief vote counter, predicted that voters' economic worries would force Congress to act. ``The impact this could have on the markets will have a big impact on getting people back to wanting to work together to get this problem solved,'' Blunt said. House Republican leader John Boehner, who backed the House measure that failed, said he backs the Senate legislation. To be sure, some lawmakers say their constituents are still opposed, and they have no regrets about killing the plan that was presented to the House. ``One of the best votes of my career,'' said Representative Peter DeFazio, an Oregon Democrat. Pressure From Lobbyists While voters jammed Capitol switchboards, lobbyists also stepped up pressure on Congress to do something. A collection of 56 trade groups -- from the U.S. Chamber of Commerce to the American Meat Institute and the National Roofing Contractors Association -- released an open letter urging Congress to act. ``Virtually every American has witnessed their retirement investment and savings accounts decline steeply,'' the letter said. ``The evaporation of credit is affecting businesses of all sizes and consumers and we run the risk of further declines in housing values.'' The bank-rescue package would give the Treasury secretary broad power to buy troubled assets, chiefly mortgage-backed securities, that are burdening investors and financial institutions. The Senate's final version of the legislation is still being drafted. Under the accord, announced on the Senate floor, Republican Leader Mitch McConnell and Majority Leader Harry Reid must still agree on the language before a vote can take place. It will be offered as an amendment to a piece of House-passed legislation awaiting Senate action and called up for a vote after 7:30 p.m. Washington time. Tax Credits The tax package that's part of the legislation also includes $17 billion in tax credits for the development of solar, wind and other forms of renewable energy. It passed the Senate on a 93-2 vote last week and differs from a version the House also approved. The package would spare 24 million households from a $62 billion alternative-minimum tax that is due to take effect this year. Fiscally conservative House Democrats known as Blue Dogs opposed the Senate bill because it wasn't fully offset by new tax revenue. The House version of tax breaks was paid for. Senate leaders refused to consider the House bill, saying it would never pass in that chamber. The financial rescue measure won support from 24 of the Blue Dogs on Monday. House Democratic leaders reacted cautiously to last night's announcement of the Senate agreement. On NBC's ``Today'' show this morning, House Majority Leader Steny Hoyer said the tax extenders, which are popular with Republicans, may cause loss of some Democratic support. Not Pleased ``We're going to have to be talking to them,'' Hoyer said of the Blue Dogs. ``I'm not particularly pleased with that addition myself, very frankly.'' At the White House, the president said yesterday he realized ``this is a difficult vote for members of Congress. But the reality is that we're in an urgent situation and the consequences will grow worse every day.'' Bush ``will be speaking with senators today,'' spokesman Tony Fratto said in an e-mail today. ``This morning we're seeing increased evidence of the credit squeeze on small businesses and municipalities all across the country, so it's critically important that we approve legislation this week and limit further damage to our economy.'' To help restore confidence in the nation's lenders, FDIC Chairman Sheila Bair sought the temporary increase in the bank- deposit insurance limits. Under the measure, banks will not be required to pay additional premiums for the coverage, which expires in 2009. The FDIC change was endorsed by both Republican presidential nominee John McCain and Democratic rival Barack Obama. Both presidential candidates plan to return to Washington for tonight's vote, their aides said. Reid said he's in contact with White House Chief of Staff Josh Bolten. He also said Obama informed him he talked to Bush about the plan. ``We're working together to try to resolve this,'' Reid said.